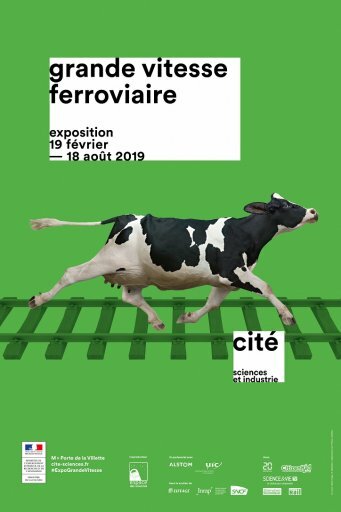 The Cité of science and industry will show you the train adventure. You'll find in this exhibition models, games, adventure tales, scientific and technical stories...You'll also come back out of it with the knowledge of several savoir-faire jobs and creations of the rail industry and of how much science is important in this domain. High-speed is a non-stop evolution since the 1980's. France is one of the biggest actors of this development: it has the high-speed world record thanks to its Train Grande Vitesse (TGV = High-speed train) that can go up to 574,8 km/h. There will be two routes in this exhibition. A technical one and an artistic one. You'll notably be able to try a TGV simulator or do a journey about rail mobility all around the world to understand how railways work in other countries. How to move a 400 tons train at 320 km/h? How to tace and build a Ligne Grande Vitesse (LGV = High-speed railroad)? How to make high-speed trains stravel in a total secure way? After the technical part, you will have to cope with the artistic one. Three artistic installations from the common exhibition "Tous les trains sont des horloges" (All trains are clocks) will be to discover. A bit more: For the European Museum Night in Paris in May, the Cité des Sciences will make you admire models of yesterday and today. While you are at Cité des Sciences et de l'Industrie, you can make your children try the Cité des enfants (2 to 12 years old) or the free outside games in the park de La Villette where you can stroll around or just have a break outside. You can also visit another exhibition such as the Body and Sport exhibition or the Argoaute sub-marine. Check where to stay close to the Cité des Sciences and the metro line. See all the nice restaurants of the Parisian North-East.